What's inside the Google Bus? What’s inside the Google Bus? We've heard rumors of baristas, free massages and movies, but what's really inside the Google bus? 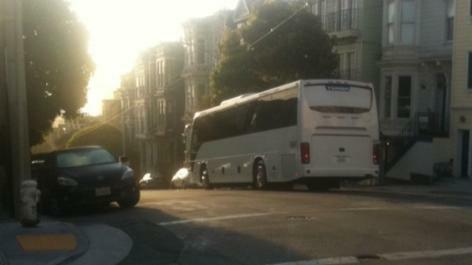 The magical white monstrosity that you see barreling down Hayes Street in San Francisco towards the sunrise and beyond is a special bus. One you won’t find anywhere else. One that’s on its way to change the world. This bus, my friends, is transporting precious cargo: the minds of the future. Behold the GOOGLE bus. How do I know for sure with its lack of corporate signage, tinted windows, and only a small Mountain View header? I just do. We’ve all heard the rumors about what’s on board: a Blue Bottle barista siphon-brewing organic fair trade single origin beans sustainably farmed in Guatamala; an attractive blond masseuse specializing in deep tissue and shiatsu; an elliptical machine and resistance bands supervised by a licensed yogalates instructor; master som and mixologist (return journeys only); business-class-style turndown service for napping; and feature length films available in IMAX 3D or widescreen. All that in addition to WiFi (obviously), server access for uninterruped monitoring of the zero-world problem thread; personal entertainment pods; unlimited supplies of Red Bull; and plenty of spare hoodies and messenger bags.